PVC Strip Curtains or Crash Doors provide the most practical and economical solution to heat and noise pollution in the workplace. The most common benefits for strip curtains are reducing heat loss, workplace safety helping to exclude birds and vermin. Also available in polar grade for low temperatures and cold rooms. Whether you want to cut heat loss, preserve cold, control noise, limit pollution or improve weather protection, we have a range of affordable PVC strip curtain products to suit your application. The perfect heavy duty, cost effective system for general purpose doorways, cool rooms and freezer rooms. Each system is custom made to suit your openings individual internal (lintel mounted) or external (fascia mounted) dimensions. 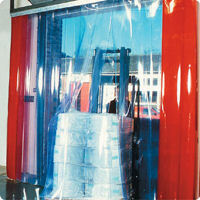 GB PVC Strip Curtains are based on crystal clear PVC strips in a wide choice of widths and thickness. Each strip hangs on a slotted stainless steel plate assembly, which in turn, hooks onto a stainless steel mounting rail. Individual plated strips can easily be removed or replaced to even out wear and for routine cleaning operations.